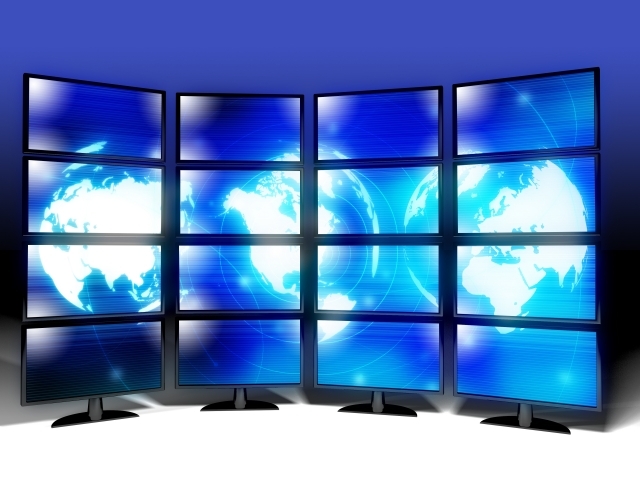 What is a Virtual Operations Support Team? We are a diverse mix of professional emergency managers and disaster volunteers of varying skill levels with one major thing in common: an enthusiasm for learning how to use social media in disasters, and for developing ways to operate that will make things easier for ourselves and others in future disasters. We like to share what we learn with others. While many of us already knew each other and/or had worked other disasters together, we were first assembled as a group by Jeff Phillips (@losranchosEM 0r @_JSPhillips) as a team of “trusted agents” in March of 2011. The idea is that in a disaster, anyone trying to monitor and respond using social media will be quickly overwhelmed by the amount of data that needs to be examined and sorted into useful information. In a catastrophic disaster this need is only amplified and there will also probably be a need for a predetermined, trusted person or group to search, proritize and forward crisis data from outside of the disaster location if the internet is not functioning or bandwidth is limited, or again, if the on-site personnel are overwhelmed by the amount of crisis data incoming. SMEM Camp: Our first “proof of concept” effort (from now on I’ll call them instances) was set up in March 2011 by Jeff Phillips to support the “#SMEMCamp” panel at the NEMA Annual Conference. I won’t spend a lot of time discussing this instance, as Jeff did a great explanation of it here. I will say , however, that in my view it was a great success in demonstrating that a group of volunteers well-versed in SMEM could be of great asistance to each other if they coordinate their efforts, and plan in advance to do so. Our next effort was in support of the 140 Conference Northwest, aka #140confNW, which was held in May in Vancouver, Washington. We were led in this instance by Cheryl Bledsoe (@CherylBle) of Clark Regional Emergency Services Agency (@CRESA). The VOST members that were on-site worked to live-tweet the conference, communicate problems to the internet audience, and help answer questions that were being asked via twitter as best we could. Some of our team were also helping from various locations around the country by monitoring the live stream and live tweets of the event, as well as search for relative material available on the internet. For example, if a conference speaker mentioned a website and one the on-site VOST members tweeted the info without a link, the off-site members found the URL, and then retweeted the info with the URL attached. The VOST also tweeted links to other supporting materials. 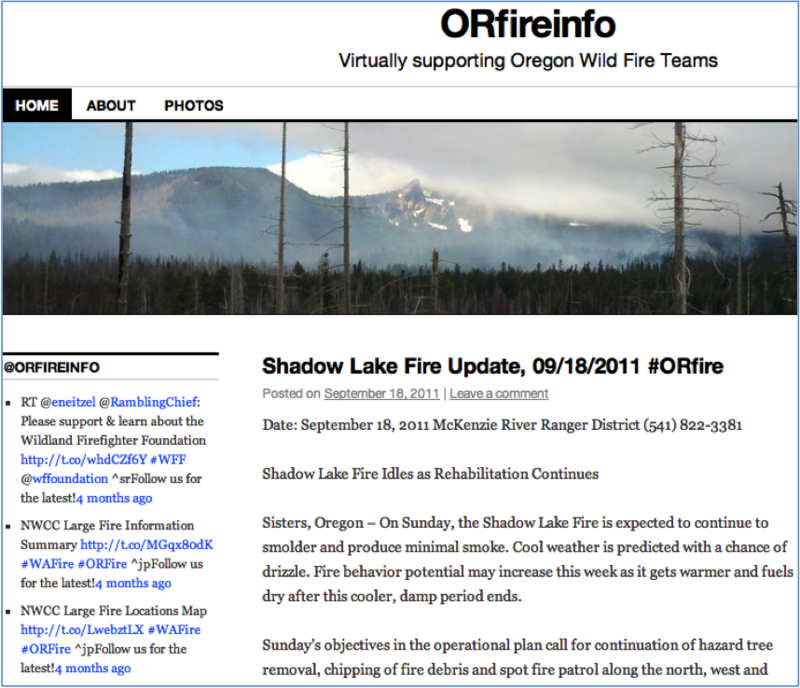 The fifth VOST instance was the Shadow Lake wildfire in Oregon. Jeff Phillips was contacted by Kris Eriksen of the National Incident Management Organization (NIMO) who wanted to test the use of social media as part of informational support during the wildfire response. (there is a paper due out on that particular VOST effort soon, and I’ll get a link up for that as soon as it’s available.) VOST member Pascal Schuback set up the ORfireInfo blog, I set up twitter & gmail accounts, a shared dropbox file, a facebook account and a Keepstream social media curation account for saving relevant media articles. We did all of this for in order to keep the NIMO staff informed of what the media and citizens on twitter & Facebook were saying and asking in regards to the fire, and were able to respond to the public. Each of the above VOST instances really needs to have its own unique story told, but I wanted to get this out there before we get too far away from the early efforts to get the discussion started. People on the #SMEM hashtag have been wondering what #VOST is about, so I hope that provides a little of the background. Applying the VOST concept to a disaster of catastrophic scale is not difficult to imagine. I see myself getting on site to my county EOC after a major earthquake, where I know I will only be able to process so much crisis data by myself or with a couple of helpers. But, if I am able to utilize a VOST I could contact my trusted agents and ask for help in processing this data. (Some of us are discussing MOUs so that the VOST can self-deploy in case contact is not immediately possible.) Perhaps some people are trapped in their home, unable to make a voice call, but they can get a text message out via twitter, or a text message to someone who then posts it to facebook. VOST members can search for these cries for help on twitter, and help to sift that data out and pass it on so that I can relay it to those who can help. *** I want to mention that I’ve been only been heavily engaged in social media use in disasters for about a year and a half now. That was about the time that I realized (by viewing the Red Cross Crisis Data Summit) how important social media was becoming in all phases of disaster. I’m sure that there are others that need to be acknowledged as innovators and originators in this work, but I’m basing this piece on what I know, so please feel free to fill in the back story in comments. I want to acknowledge both Jeff Phillips, and Heather Blanchard of Crisis Commons as the people that I first heard use the terms Virtual Operations Support” as applied to Emergency Management, and “DOC or digital operations center”. This entry was posted in Social Media and Emergency Management and tagged Cheryl Bledsoe, Emergency management, Hurricane Irene, Jeff Phillips, March 2011, SMEM, social media, VOST. Bookmark the permalink. This is great! Certainly love the name! Humanity Road, http://www.humanityroad.org/ , with US military. Thanks so much for your comment and the links. I do write about all of those groups quite a lot. Their work is also very inspiring.